La Perrières Theatre des bons engins is the earliest, and probably the most popular and influential French emblem book. Although the first edition was published early in 1540, only a few months before Corrozets Hecatomgraphie (also published by Janot), the Theatre actually predates the Hecatomgraphie by some four years, since La Perrière tells us he presented an incomplete manuscript version of the work to Marguerite de Navarre when she visited Toulouse in 1535. The work was completed in 1536, but not published until 1540. Its popularity both in France and elsewhere in Europe is evident from the fact that not only did it run through a number of editions in both Paris and Lyons, but Dutch and English versions were also published in Antwerp (Tpalays der gheleerder ingienen,1554, 1556, 1564) and London (Theatre of Fine Devices, 1593, 1614). Guillaume de la Perrière was a native of Toulouse who was much involved in the cultural life of that city. Between 1537 and 1552 he was responsible for recording the chronicles of Toulouse, and in 1535 as well as presenting an early manuscript version of his first emblem book to Marguerite de Navarre, he also designed commemorative gold coins that were struck to commemorate her visit. Not only was he friendly with other Toulouse literary figures such as the notorious anti-feminist, Gratien du Pont, but also with more nationally known figures such as Clément Marot. He was a keen advocate of the vernacular (and under his regime the Toulouse chronicles were for the first time written in French rather than Latin), and it is significant that his purely French Theatre was clearly much more popular in market terms than his Latin/French second emblem book, the Morosophie, which ran to only two editions. As well as the Theatre and Morosophie he also produced two other collections of verses that could also be considered to be emblem books, the Cent considerations damour (1543) and the Considerations des quatre mondes (1552), both published in Lyons like his Morosophie and later editions of the Theatre. This text is from the last of the four editions of the Theatre published by Denis Janot in Paris between 1540 and 1544. It is often suggested that an undated unillustrated edition published at the mark of Daedalus (Lyons, Denis de Harsy) is the first edition dating from 1536, but in fact this was a pirated edition which postdates Janots second edition. 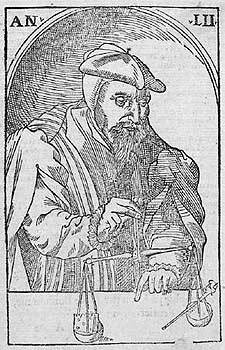 After Janots death, his successor in Paris, Etienne Groulleau produced two further editions in 1548 and 1551, and an edition was produced in Angers by Pierre Trepperel (of which no known copy survives). More significant than these were the four editions published by Jean de Tournes in Lyons between 1545 and 1549, with newly designed woodcuts and with the addition of moralising titles, since it is the Jean de Tournes model that was followed in both the subsequent Dutch and English versions of the Theatre.Together with 26 emblems from Corrozets Hecatomgraphie, 32 of the Theatre emblems were included in an anthology of moralising verses published in several editions by Etienne Groulleau from 1548, entitled Le Jardin dhonneur. (See BFEB F.346-50), and 12 appeared as late as 1641 in an edition of Emblemes ou preceptes moraux tirez des escrits de feu Gilles Corrozet, published in Paris by his descendant Jean Corrozet. This edition (like the third Janot edition) contains 100 emblems, whereas the original version of the work as published in the first two Janot editions included 101 emblems. The text of the third and fourth editions is modified (presumably by La Perrière himself) excising superfluous imagery and simplifying the text so that the moral lessons are expressed more clearly. Like Corrozets Hecatomgraphie, also published by Janot, the Janot editions of the Theatre are highly decorative and lavishly laid out pieces of printing, with each emblem occupying two facing pages, the first containing the woodcut figure and the second the 10-line accompanying verse, both enclosed in ornate frames. GUL: SM686: D1v-D2r. Actual page height: 160mm. In their original form as published by Janot, the Theatre emblems do not include moralising titles. Only in the De Harsy edition, and in the editions published by De Tournes were (different) sets of titles are added. Although it is said in the privilege that Janot disbursed plusieurs deniers à la taille des figures none of the Theatre woodcuts (which are slightly larger than those habitually used by Janot) are re-used in other works published by him subsequently, so it is possible that, despite what is said in the privilege, La Perrière himself supplied them, even if Janot could have paid for them.